A fantastic deal on the Sellier & Bellot 180 grain soft point round that is perfect for hunting large game. 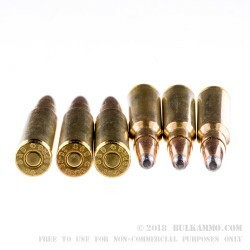 This is a 180 grain soft point projectile with a Boxer primed brass case that has a static ballistic performance of 2707 feet per second velocity and an energy delivery of 2937 ft. lbs. It is a reloadable cartridge casing and the load from factory represents an excellent price point for a factory load with these performance metrics and value added benefits from a company with the prestige and history of production reliability that S&B has. Perfect for Deer, Elk and Moose, this is a great big game load with the well deforming soft point bullet and the adequate ballistic performance. It is suitable for use in most jurisdictions for hunting large game but be sure to check with your local and state regulatory agencies to be sure. The accuracy is held to about 1-1.5MOA and better accuracy can be achieved with proper conditions and hardware. 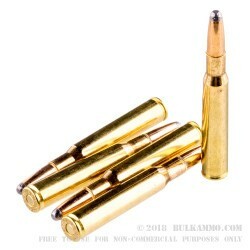 The high quality brass will suit reloaders well. This is suitable for use in any commercially produced .30-06 firearm marked as such. A: We do not generally stock .30-06 military surplus ammo. 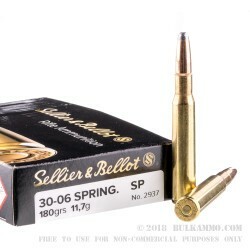 Q: I heard that some Sellier and Bellot ammo is magnetic. Many ranges in California have banned its use. Is this ammo Magnetic? 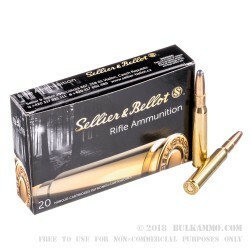 A: Some Sellier & Bellot ammo is loaded with bimetal jacketed bullets, but they do not indicate that this ammo is loaded with anything other than copper jacketed bullets.